Anyone who’s interested, come to one, or both… Bring a friend… If those days don’t work, let me know. I can schedule another session. Sessions run 3-4 hours, but that’s really flexible. As some of you know, I’ll cut folks loose if they’ve gotta get going or whatever. Every group’s different. Think of it as a group ride where you actually get to stop, share & learn, instead of just trying to keep up. This is not a business, so there are no fees. However, folks have offered donations in the past, and since I live on “ranger pay”, they’re definitely appreciated. 2) If something scares you or makes you too nervous, you don’t have to do it. In fact, I WILL NOT LET YOU DO IT! So if you’re a little sketchy on the dirt, no worries. Hardly anyone dies on my rides! Call me for directions or specific questions. Calling’s better – for me, typing emails is right up there with getting a colonoscopy. The testimonials below are a lot better than having to read any of my overblown descriptions. I participated in Randy Victory’s Bike Skills class on March 29, 2013. This was to continue my certification in the National Mountain Bike Patrol so that I could continue to patrol here in the Village of Oak Creek area. I just want you to know that this class, and Randy’s instruction, was a truly remarkable learning experience. Yes, I learned some things I did not know (I’ve been riding for 54 years) and I feel more confident out on the trail. The real thing I want you to know is what an articulate, knowledgeable and compassionate instructor Randy is. At one point in the first part of the class, before we went out on the trail, I noticed a lot of play in the front part of my bike. I locked the brakes and rocked the bike back and forth a bit. There seemed to be more movement than I thought there should be. Randy was nearby and not busy with anyone else so I asked him if my headset was loose. I just wanted to know. He whipped an all-purpose tool from the little holster on his belt and proceeded to, not only fix, but explained how the headset was constructed, how to adjust it, line it up and tighten it all back down. He fixed it on the spot.. Now I can perform this adjustment myself. Anyone else would have just told me to take it to a shop. This 90-second slice of time out of the 6 hours of the class just demonstrates how Randy takes a personal interest in each student he has in his class. I saw him giving individual, pertinent and kind attention to everyone who needed it. He is a bicycle geek, psych counselor and friend all at once. He genuinely wants everyone to learn something, to take away new confidence with them and be a better rider as a result of his class. In short, Randy and the class are outstanding. I am recommending this class to everyone I talk to who rides a bike on the trails around here. Randy is a precious resource and I hope this class continues. Thanks for the great training day!!! You put on a great course.. I have heard many of the students mention things that they learned at the class, believe it or not!! Even though so many of them are experienced, they still learned important things about riding. I think it is a perfect addition to the patrollers training! Just a quick thank you note for the class yesterday. It was great to meet you and learn from you. My wife also enjoyed the experience (who’d of thought a broad her age could descend over a step 2 railroad ties tall on a hard tail 26 incher………..lol). The approach you take presenting the material makes the class educational for all levels. Thanks again and look forward to seeing you on the trails in the years ahead. BTW…..we live around the corner from the Soldier’s Pass trail head so if you are ever heading this way for a ride……….let me know. I wanted to write this letter to thank you for the mountain bike classes we took from you at Dead Horse Ranch State Park this past spring. We learned a lot in the class and had a lot of fun in the process. As you may remember, we brought several of our friends with us to the class over a couple of weeks. Our friends from Phoenix also had a great time and were motivated to go and buy their own mountain bikes. Our friends from Flagstaff have told other friends, and now they too want to attend a class in the future. That is why I am writing this letter, I am hoping there are more classes scheduled for this fall when those hot Cottonwood temperatures come back down to human level. I don’t want to exaggerate, but seriously I think I have about 10 – 12 people, guys and girls, who want to come down to the class this fall. Some from Phoenix and some from Flagstaff. They will be camping at the Park for the weekend, I might have to start making reservations now for our group. I just need the dates when the class starts again. I will also be watching the website for more information. Thanks again, and we look forward to seeing you soon. In May of 2011 I had the pleasure of taking one of your instruction classes at the park. It really peaked my interest in wanting to learn how to mountain bike ride. I live in CO and come to Cottonwood usually once a month for about week at a time through out the winter. I was wanting to know if you are having any more instructional classes this year. If so when they might be. Or can you recommend someone or a business in the area I could hire to teach me the basics. Do you give private lessons? Thank you for the great class today! I felt like I got 30 years of experience in one day–well, almost anyway! I really appreciate the way you explain everything about mountain biking, from physics to courage! We appreciate the program you lead and hope we can get a group of Scouts there after the first of the year! 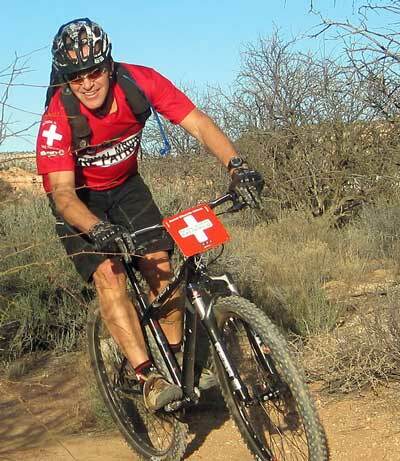 We are sorry that we haven’t been able to attend any of your Fall Mountain Bike classes. We really enjoyed the classes we attended in the Spring and we learned a lot, which has greatly enhanced our overall riding enjoyment. We have ridden many of the trails closer to home, including some that seemed impossible before your class. We even entered and finished a race! loved it. Regardless of their initial skill, they all came away better riders and with more confidence in their own capabilities and respect for others. We take every opportunity to encourage bike riding, both road and mountain, among the youth in our little town. As a result of word-of-mouth from the kids we brought down in the Spring, there is now a waiting list of kids who would like to make the trip. We had hoped to bring groups from our church youth group and neighborhood down this Fall, but the logistics fail. If we left Winslow immediately after Sunday School we still wouldn’t get to the park until after 2:00. We don’t have the resources to bring them down on Saturday so they could attend church in Cottonwood and still make the class on Sunday. Needless to say, neither we nor their parents want to encourage substitution of anything else for church, so we’re stymied. I recently attended the “mt Bike basics ” class given by Randy VIctory. He is such a great instructor! The class was varied from expert, adv. beginners to real Beginners….he was patient, fun, and a clear communicator. I felt like my time was very well spent and that I may sometime in the future upgrade equipment if I spend some time on the “trails”…..ThankYou to RANDY and the State Parks system! KEEP up the great work !!! Thanks for all the info today, Randy! Believe it or not, I definitely picked up a few new things and to avoid even 2 seconds of that horrible COW noise that brake was making I tried your lil’ jump turn on the way back down! Yikes! I ended up going w/the brand new (2013) Avid X9s…hopefully they’ll last as long as my Maguras did.. Separately, I’d love to come tag along behind you sometime on a ride. You’re friggin fast…and smooth! I’m thinking you and I should put some stuff together…you for the skills part, me for getting people in shape (and a ‘training/playing’ plan).